Blue Apron says it saw a 24% year-over-year drop in customers during the second quarter. Shares are down about 20% Thursday morning. Watch Blue Apron trade in real time here. The company said total customers fell 8.8% quarter-over-quarter and 24% versus a year ago. Revenue per customer slipped to $US250 from $US251 last year. Blue Apron has struggled to retain customers as Amazon, Walmart, and other players have entered the space. “As we previously articulated, 2018 is a year of transition and building for the future,” CEO Brad Dickerson said in the earnings release. The meal-kit maker reported a loss of $US0.17 a share as revenue plunged 25% year-over-year of $US179.6 million. Wall Street analysts surveyed by Bloomberg were anticipating a loss of $US0.17 per share on $US188.6 million of revenue. 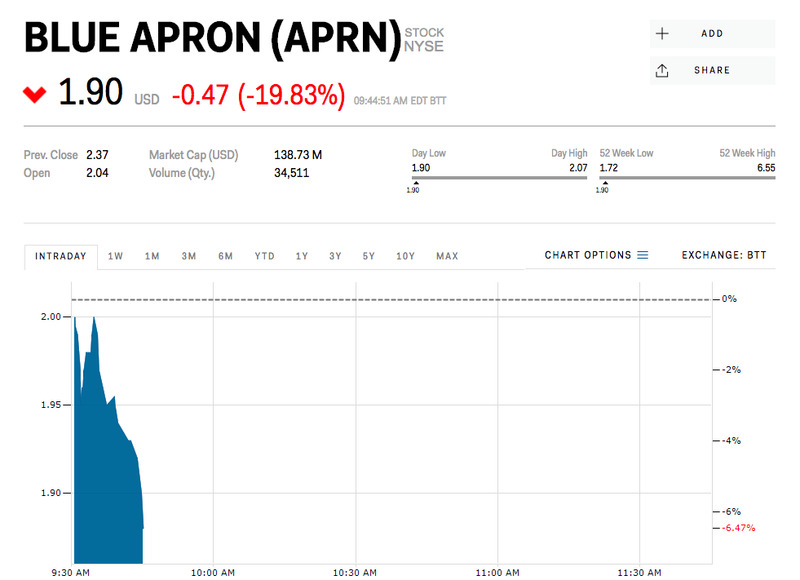 Blue Apron shares were down 41% this year through Wednesday.